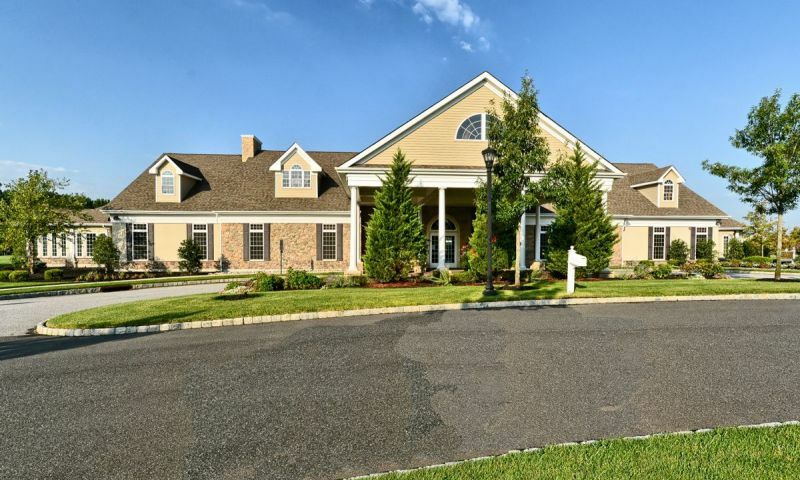 Four Seasons at Weatherby in Woolwich, New Jersey is a 55+ neighborhood situated in lovely Gloucester County only 30 minutes southwest of Philadelphia. This beautiful gated community, built by K. Hovnanian, is open to adults aged 55 and better, and will contain 428 homes upon completion. Here, residents can enjoy resort-style living and a climate that includes all four seasons. Activities begin with the various amenities found at the spacious community clubhouse that include an outdoor swimming pool, tennis courts, multi-purpose rooms, and sports courts. Four Seasons at Weatherby’s community events and social clubs also encourage residents to get to know their neighbors, while a full-time activities director is on hand to organize it all. Four Seasons at Weatherby’s surrounding areas offer quaint shopping districts, farmer’s markets, antique shops, restaurants, and both public and private golf courses. The community is within easy distance of nearby Philadelphia, Atlantic City, and Baltimore’s Inner Harbor as well. Four Seasons at Weatherby is an impressive 55+ community for active adults in New Jersey. The spacious clubhouse at Four Seasons is the center of activity in this resort-style community. Residents can stay in shape in the state-of-the-art fitness center or take a class in the aerobics studio. Four Seasons at Weatherby’s clubhouse contains many amenities including billiards, card rooms and a cozy fireside lounge. The lovely ballroom is an ideal location for community events and parties. Residents can also relax with a good book in the library or or attend a club in the meeting room. The terrific amenities continue outdoors with a pool and patio greeting residents as soon as they walk outside. Residents can also enjoy tennis courts, bocce ball courts, horseshoes and shuffleboard. Walking and biking trails wind throughout the community and wind around the scenic ponds that are scattered throughout the neighborhood. Four Seasons at Weatherby features single-family homes in fourteen different floor plans, all built by the community developer, K. Hovnanian. These beautiful homes include one to three bedrooms and one-and-a-half to three bathrooms. Depending on the options chosen, the model homes range in size from 1,306 to 3,430 square feet. There are many popular features available in Four Seasons at Weatherby’s homes. Potential residents will find features such as designer kitchens, breakfast nooks and formal dining rooms. Each home in the community also includes a two-car garage. One of Four Seasons at Weatherby’s most popular floor plans, the Captiva, has a second-story loft option as well. The residents of Four Seasons at Weatherby enjoy resort-style living that is conveniently located near many popular destinations. While some active adults migrate to southern climates, others opt for an amenity-rich community that is near their hometown, families and friends. Four Seasons at Weatherby offers plenty of on-site amenities to support an active lifestyle, as well as a variety of community events and groups to help residents get involved. The social clubs at Four Seasons are a great way for residents to get to know their neighbors while exploring either a new, or long-held interest. Just a few of the community’s social clubs include the photography club, bird watching club, tennis club and dining-out club. Groups also meet to play card games or play Wii video games. A full-time activities director can help residents get involved with the community’s social events and clubs, or plan excursions to nearby hot spots. Four Seasons at Weatherby is located in Woolwich amid the scenic beauty of Gloucester County. With convenient access to Route 42 and the Atlantic City Expressway, Four Seasons is within easy distance of Philadelphia and South Jersey. Residents also enjoy the community’s close proximity to hot spots like Atlantic City and Baltimore’s Inner Harbor. Closer to home, residents can enjoy Woolwich’s new town center or visit the neighboring quaint town of Swedesboro. The surrounding areas have much to offer including farmer’s markets, antique shops, restaurants and both public and private golf courses. Four Seasons at Weatherby is a terrific active adult community that also boasts a desirable location that is close to shopping, restaurants, recreational facilities and major highways. There are plenty of activities available in Four Seasons at Weatherby. Here is a sample of some of the clubs, activities and classes offered here. Four Seasons at Weatherby features single-family homes in fourteen different floor plans, all built by the community developer, K. Hovnanian. These beautiful homes include one to three bedrooms and one-and-a-half to three bathrooms. Depending on the options chosen, the model homes range in size from 1,306 to 3,430 square feet. There are many popular features available in Four Seasons homes. Potential residents will find features such as designer kitchens, breakfast nooks and formal dining rooms. Each home in the community also includes a two-car garage. One of Four Seasons at Weatherbys most popular floor plans, the Captiva, has a second-story loft option as well. This community is beautiful! The quality of our new home is evident in every room. We.looked at several 55+ communities in the area and Four Seasons was far above the others in quality of build, in our opinions. The layouts (we looked at several) are open and efficient, with attention focused on spaciousness of living areas, kitchens and master bedrooms. No cut up floor plans or wasted space here. Our new neighbors have been friendly and very welcoming. The clubhouse is gorgeous with state of the art gymnasium, a substantial library, game and meeting rooms and a fantastic patio and pool area. Grounds staff were still working in late December removing leaves, etc. We remember driving into this community after visiting a few others, breathing a sigh of relief and saying, "now this is more like it!" We thought we might head to Florida for retirement but when we came across this community so close to our old neighborhood we decided it was better to stay in NJ close to our family and friends. It took us awhile to get used to living in a home so close to our neighbor but now it really doesn't bother us at all. We like our neighbors and couldn't imagine having to take care of our old big house and huge lawn at this stage of our lives. 55places.com is not affiliated with the developer(s) or homeowners association of Four Seasons at Weatherby. The information you submit is distributed to a 55places.com Partner Agent, who is a licensed real estate agent. The information regarding Four Seasons at Weatherby has not been verified or approved by the developer or homeowners association. Please verify all information prior to purchasing. 55places.com is not responsible for any errors regarding the information displayed on this website.